Giving up pasta was one of the most difficult adjustments for me. Not because I wanted the sluggish feeling that I get from that type of carbohydrate, but because there are certain dishes where I am conditioned to use noodles or rice to complete the meal. I was raised this way and it was hard to break because I am just not a person that just eats plain noodles or rice; most of us aren't. I like my broccoli alfredo sauce and spaghetti sauce on the noodles. I used to use butter and spices if they were plain, and I used to eat a lot of it. Regardless, in trying to become my healthiest and with the Skinny Fiber controlling my appetite as it does, I decided to explore alternatives to traditional noodles (egg noodles, wheat noodles, etc) as part of my healthy lifestyle changes because I really do prefer to have my carbs from vegetables and fruits. If you are thinking the same then switching out your noodles for healthy alternatives might be for you. I have tried it all! 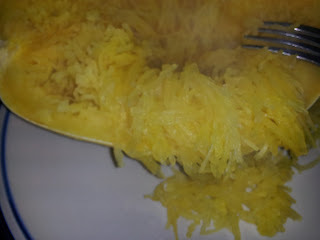 This post is about how easy it is to use Spaghetti Squash as noodles; especially if you do not have any shirataki noodles, spiralized zucchini noodles, kelp noodles or other low carb pasta alternative. Most importantly this vegetable is sweet, healthy and tasty enough that your child(ren) might like to eat this with you, so please don't forget to offer your child a taste to see if he / she would prefer spaghetti squash to noodles. 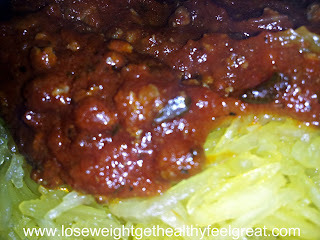 Health benefits of spaghetti squash is at the bottom of this post. Take a whole spaghetti squash and wash the outside of it. You will not eat the outside of the squash, but there are pesticides and dirt that you do not want to handle while you are preparing your spaghetti squash noodles. Cook the spaghetti squash in the oven or microwave. You can sit the spaghetti squash on a cookie sheet and bake it in the oven at 375 degrees for an hour - OR - you can pierce it through with a knife a few times and microwave the spaghetti squash whole for 12 to 15 minutes - OR you can cut the spaghetti squash in half and microwave it about 5 to 8 minutes. You want it soft but not mushy; firm but not raw-like crunchy. If it is too firm, just bake or microwave your squash a little bit more. Once your spaghetti squash is cooked through get rid of the top pulp and seeds. Then take a fork and start shredding the squash like you see in the picture above. 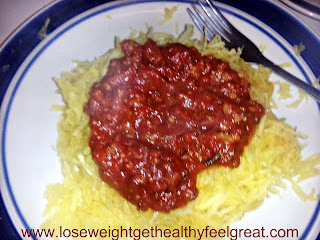 You will be amazed by how much you are going to get from 1/2 the spaghetti squash. It may end up being enough for 2 or 3 people depending upon what size spaghetti squash it is. 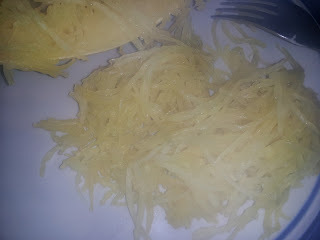 You can shred the spaghetti squash contents out on to your plate or eat it out of the squash half. NOW, YOU HAVE LOW CARB NOODLES OR LOW CARB PASTA ALTERNATIVE. Put your spaghetti sauce on top - OR - chicken / vegetable stock with sauteed vegetables is so yummy - OR - whatever you want to put on top of your squash noodles. I just want to share that in addition to spaghetti squash, shirataki noodles and spiralized zucchini noodles, you might also like to use mushrooms, green beans, chinese squash, cabbage or whatever you like. 1/2 cup of spaghetti squash is only 38 calories with 5.04g carbs, 2.05 grams fat, 0.51 grams of protein and is a good source of fiber. It is the lower in carbs of other popular squash and has minerals like calcium, manganese, zinc, selenium and copper. 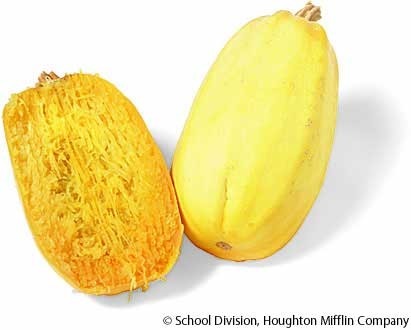 Spaghetti squash has Vitamin B6, Vitamin C, Vitamin A, Vitamin K, Manganese, Potassium.